Posted on 13, November 2018 by EuropaWire PR Editors | This entry was posted in Education, France, Science, Technology and tagged academic, EDU, fundraising, Ilian Mihov, INNOVATION, INSEAD, leaders, Rémy Best, school, transform. Bookmark the permalink. 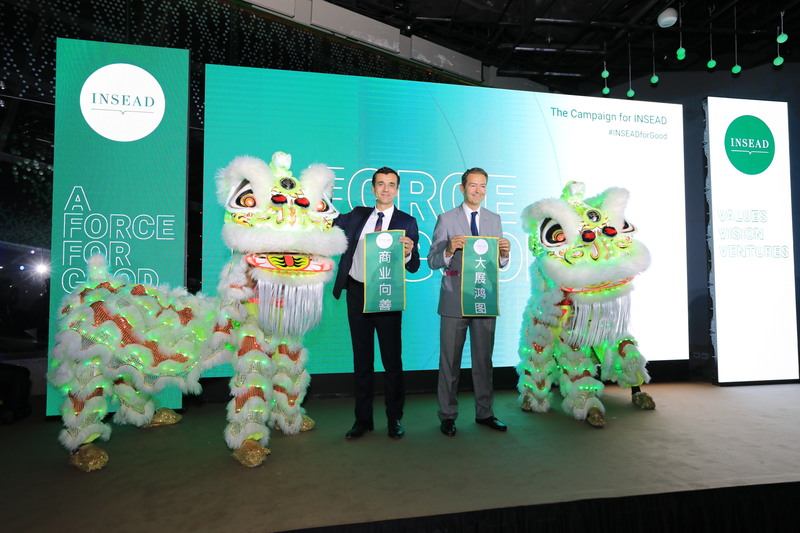 From left: Ilian Mihov, Dean of INSEAD, with Rémy Best, Chair of the INSEAD Campaign Board and Member of the INSEAD Board of Directors, at the Asia Launch of the Campaign for INSEAD at Gardens by the Bay, Singapore. INSEAD, the Business School for the World, continued the global launch of the Campaign for INSEAD on Saturday, 10 November in Singapore. With a target of €250 million, the Campaign is the school’s most ambitious capital campaign to date. Fontainebleau, France, 13-Nov-2018 — /EuropaWire/ — First announced on 5 October 2018 at its Europe Campus in Fontainebleau, the Campaign is based on the enduring INSEAD vision of business as a force for good. The Campaign aims to fortify the school’s academic excellence, drive breakthrough innovation and transform society on a global scale. As the most diverse and international business school in the world, INSEAD has an important role to play by educating leaders with a global mindset. This is especially true today as the world faces unprecedented challenges. The school believes that economic solutions to these challenges – through business strategies and practices that consider business and society – increase sustainability and promote prosperity. The world needs bold, purpose-driven leaders with nuanced global perspectives who work to achieve business goals and positive societal progress. The Campaign is anchored on three key themes – the school’s distinct values, vision and ventures. Values – By encouraging the promotion of our INSEAD values, those who support the Campaign contribute to a more inclusive, global mindset in business and society. Business and Society: To address how business can better align with the goals of society, led by the school’s new Hoffmann Global Institute for Business and Society. Scholarships: To promote geographic, socio-economic and gender diversity by ensuring that highly qualified students anywhere around the world can access its MBA programme. Vision – Contributing towards INSEAD’s vision advances leadership that strives to change the world for the better. Thought Leadership: To create more endowed chairs and professorships to attract and retain the best minds in academia. Teaching Excellence: To create and support innovative pedagogy and reinforce the INSEAD culture of academic excellence. Space Transformation: To shape tomorrow’s business leaders by providing innovative spaces for teaching, learning and collaboration. To renew our historic campus in Fontainebleau, France. Ventures – Investing in INSEAD’s newest ventures pushes the boundaries of what constitutes excellence in business education. Digital Transformation: To offer insights and strategies that will help businesses thrive in the digital age. Entrepreneurship & Innovation: To create leading-edge initiatives and boost resources to amplify the school’s entrepreneurial spirit and innovation success. Today, the Campaign has achieved an important milestone, reaching 59 percent of its overall target with strong support from over 11,300 alumni and friends. INSEAD encourages support from alumni, partners and friends to help sustain the momentum of this Campaign. Your support makes a difference for the future of INSEAD and changes how business is done around the world – today and for decades to come. For more details of the Campaign for INSEAD, click here. Follow the Campaign milestones through its newsroom, social media channels and via the hashtag ‘#INSEADforGood’. As one of the world’s leading and largest graduate business schools, INSEAD brings together people, cultures and ideas to develop responsible leaders who transform business and society. A global perspective and cultural diversity are reflected in all aspects of its research and teaching. With campuses in Europe (France), Asia (Singapore) and the Middle East (Abu Dhabi), INSEAD’s business education and research spans three continents. The school’s 154 renowned Faculty members from 40 countries inspire more than 1,400 degree participants annually in its MBA, Executive MBA, Executive Master in Finance, Executive Master in Change and PhD programmes. In addition, more than 11,000 executives participate in INSEAD’s executive education programmes each year. In addition to INSEAD’s programmes on its three campuses, INSEAD participates in academic partnerships with the Wharton School of the University of Pennsylvania (Philadelphia & San Francisco); the Kellogg School of Management at Northwestern University near Chicago; the Johns Hopkins University/SAIS in Washington DC and the Teachers College at Columbia University in New York; and MIT Sloan School of Management in Cambridge, Massachusetts. In Asia, INSEAD partners with School of Economics and Management at Tsinghua University in Beijing, and China Europe International Business School (CEIBS) in Shanghai. INSEAD is a founding member in the multidisciplinary Sorbonne University created in 2012, and also partners with Fundação Dom Cabral in Brazil. Around the world and over the decades, INSEAD continues to conduct cutting edge research and to innovate across all its programmes to provide business leaders with the knowledge and sensitivity to operate anywhere. These core values have enabled INSEAD to become truly “The Business School for the World”.